This recipe comes from my mother-in-law's dear friend Linda. This soup is so delicious, healthy and so easy to make. My little guy absolutely loves this soup. He's had it for either lunch or dinner the past few days. This recipe makes a lot of soup. I froze some of it in my Mumi&Bubi trays, and gave some to my neighbors and we still have a lot left over! This is for little one's 10+ months and mommies and daddies of all ages. In a large pot bring the water, lentils and oil to boil. Lower heat to medium (slow boil) and add chopped celery, onion, garlic, tomato, spinach and boullion cubes. After cooking for 45 minutes to 1 hour add the ham or prosciutto, 1 cup pasta and garlic salt if needed. Cook the pasta time and then turn off heat. The pasta will continue to cook. Serve and enjoy! Mmmm, this sounds yummy! 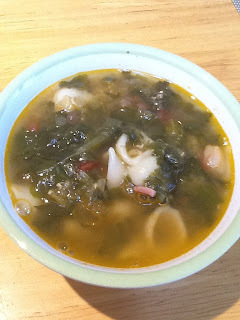 I have a version of lentil soup on my family recipes blog too: http://jessica-healthymommyhealthybaby.blogspot.com/2011/04/meatess-mondays.html. I found you via Bloggy Moms, and I'd like to invite you to my first Meatless Monday recipe blog hop next Monday! I hope you'll contribute something yummy!